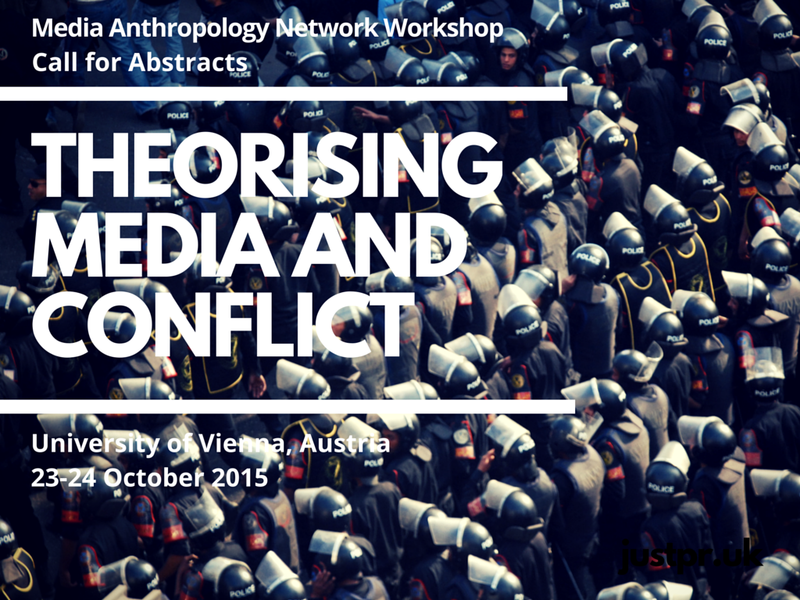 The Media Anthropology Network of the European Association of Social Anthropologists (EASA) has issued a call for proposals for the a workshop on conflict and media. The goal is to bring together in Vienna next Fall a group of anthropologists and fellow travelers who are interested in developing sophisticated ways of theorizing media and conflict. Obviously, the so-called “Facebook revolutions” and “Twitter revolutions” of the Middle East and North Africa should be represented here. But if you want to participate you’ll have to hurry; the deadline is Sept. 20th–less than a month away! (Bräuchler & Postill, eds), and the second volume, Theorising Media and Change (Postill, Ardevol & Tenhunen, eds) is forthcoming. The aim of the series is to place media anthropology at the forefront of theoretical advances in both anthropology and media and communication studies. Please send your questions and abstracts (max. 300 words) by 20 September 2015 to John Postill (john.postill@rmit.edu.au) and Philipp Budka (philipp.budka@univie.ac.at). N.B.There will be financial assistance with travel and accommodation expenses available to participants who require it. Please contact the organisers for further information if you require such assistance. The organisers are grateful to EASA, the Austrian Research Association (ÖFG), and the Department of Social and Cultural Anthropology, University of Vienna, for their generous support of this event.